The present study was aimed to gather information on genetic association of traits with respect to seed yield and its components. The genotypes were planted in 9 × 9 simple lattice designs at Melkassa Agricultural Research Center, Ethiopia, during the 2014 cropping season to determine the nature and extent of phenotypic and genotypic correlation and path coefficient analysis among 13 quantitative traits. Analysis of variance revealed significant difference among genotypes for all traits studied. Mean performance of genotypes revealed that the highest mean seed yield/plant (8.6g) recorded for Oromia-22 and the lowest mean seed yield/plant (2.6g) for Oromia-9; with overall mean of 5.33g/plant. Whereas, the highest mean oil content (52.15%) noted for Oromia-13 and the lowest (43.35%) mean oil content was recorded for Am-SW-7 genotypes; with overall mean of 47.1%. Traits viz., number of capsules, biomass yield, harvest index and 1000 seed weight showed highly significant and high positive correlation with seed yield, indicating that these traits are reliable yield components and seed yield can be improved through direct selection of them. Moreover, plant height and number of seeds/capsule showed highly significant but moderately positive correlation with seed yield; hence, these trait scan also be considered alternatively for yield improvement in sesame. Maximum positive direct effect on seed yield was exerted by number of capsules, biomass yield, and days to maturity and harvest index, suggesting that these traits can be used for selection to improve the primary trait. Over all, the use of the above mentioned traits in sesame improvement program (of the mid-altitude areas of Ethiopia) would increase seed yield. Sesame (Sesamum indicum L.) is an annual plant of Pedaliaceae family considered to be the oldest of the oil seed crops cultivated by man, having been grown in the Near East and Africa for over 5,000 years for cooking and medicinal purposes . Generally, 65% of worlds same production is used for edible oil extraction and 35% for confectionary purpose . The fatty acid composition is rather attractive, due to the high level of unsaturated fatty acids. Sesame seed is the single readily available source of protein high in sulfur containing amino acids . It is the major cash crop for small holder farmers and a valuable foreign exchange revenue commodity for different countries. The remaining cakes of sesame are used as a source of crude protein for animal feed. In Ethiopia, sesame is used as cash crop, export commodity, raw materials for oil industries and as source of employment opportunity. Now-a-days, it becomes the primary export oil crop playing a role in the agricultural Gross Domestic Product (GDP) of the country. A sizable proportion of the population, therefore, generates income from oil seed farming, trade and processing . However, sesame production and extension in Ethiopia is quite limited, particularly because of its low yield. One of the major problems facing sesame production in Ethiopia has been growing of inferior varieties with low yield and poor quality. To overcome problems of the low productivity of sesame, there must be a sound procedure for selection of high yielding varieties adapted to the local environment . Seed yield in sesame like other field crops is a multi facet character and direct selection or this trait may often be misleading. The components that determine the yield are best indices for selection. Therefore, knowledge of relationship between important yield traits and seed yield may help the researchers to identify suitable donors for a potential and successful breeding program . Estimation of character associations could identify the relative importance of independent traits contributing to dependent ones and suggest up on the traits that may be useful as indicator for other traits. In other words, character associations between yield components can be used as the best guide for successful yield improvement by indirect selection. Achievement of such success depends upon sort and accuracy of estimated correlation coefficient, plant materials, environmental conditions and their interaction. Among several factors, yield related traits highly influence the amount of grain yield that can be obtained . Some of the yield related traits in sesame include: days to flower, days to maturity, plant height, number of branches, capsules per plant, capsule length, number of seeds per capsule, thousand-seed weight and seed yield per plant. These traits affect yield positively and/or negatively and their effect on yield depends on the influence of environment on them. The knowledge of nature and magnitude of genetic variability is of immense value for planning efficient breeding programme to improve the yield potential of crop species. Likewise, information on genetic association of plant traits with seed yield has great importance to breeder in selecting desirable genotypes . Phenotypic selection of parents based on their performance alone may not always be reliable procedure since phenotypic expression is highly influenced by environmental factors, which are non-heritable. It is therefore essential to select genotypes on the basis of their genetic worth . Thus, correlation helps in selection of superior genotype from diverse genetic populations . However, in correlation studies indirect associations become more complex and confusing but path analysis can avoid this complication by measuring the direct influence of one trait on other as well as permits the partitioning of a given correlation coefficients into its components of direct and indirect effects [9,10]. The path coefficient analysis is an effective means of analyzing direct and indirect causes of association and permits critical examination of the specific traits that produce a given correlation. It provides information about magnitude and direction of direct and indirect effect of the yield components [11,12]. However, lack of information (particularly agro-ecological based) on character association of yield and its contributing traits, believed to limit the genetic improvement of sesame in Ethiopia. Hence, the present investigation was focused to gather adequate information on genetic association of yield and yield related traits in sesame accessions collected from mid-altitude areas of Ethiopia. The experiment was conducted at Melkassa Agricultural Research Center (MARC), Ethiopia, during the 2014 cropping season. Melkassa is located along the upper awash valley between 8033’N and 39017’E. The altitude of the Centeris 1550 m.a.s.l and the minimum and maximum annual temperature ranges from14.35 to 28.22°C, respectively. The mean annual rainfall in the area is 704.8mm with verti-cambisol soil type of pH = 7.6. The material for the study comprised 81 sesame accessions (including three released varieties as standard checks) representing the mid-altitude areas of Ethiopia (Table 1) that were obtained from Ethiopian Biodiversity Institute (EBI) and Were Agricultural Research Center (WARC). The experiment was laid out in 9 × 9 simple lattice designs with two replications and each genotype was planted in a plot consisting of four rows of 2.5m long at a distance of 40cm between rows and 10cm between plants. All cultural practices were applied as required throughout the season. Morphological data viz., Days to 50% flowering (DF), Days to 75% maturity (DM), number of Primary Branch/Plant (PBPL), number of Capsules/Plant (CPPL), number of Seeds/Capsule (SDPC), Capsule Length (CL), Plant Height (PH), Biomass/Plant (BMPL), Harvest Index/Plant (HIPL), 1000 Seed Weight (TSW), Seed Yield/Plant (SYPL) and Seed Yield/Ha (SYH) were collected for each plot by selecting 5 plants at random from the central rows leaving as idea rows from the top and bottom to take care of boarder effects. Finally, Oil Content OC (%) was determined for each genotype from 5g of seeds using Nuclear Magnetic Resonance Spectroscope; as the proportion of oil in the seed to the total oven dried seed weight × (100). Analysis of variance was carried out for the data with SAS statistical software (9.2); to test for significant differences among the genotypes according to the standard statistical procedure described by Gomez & Gomez . 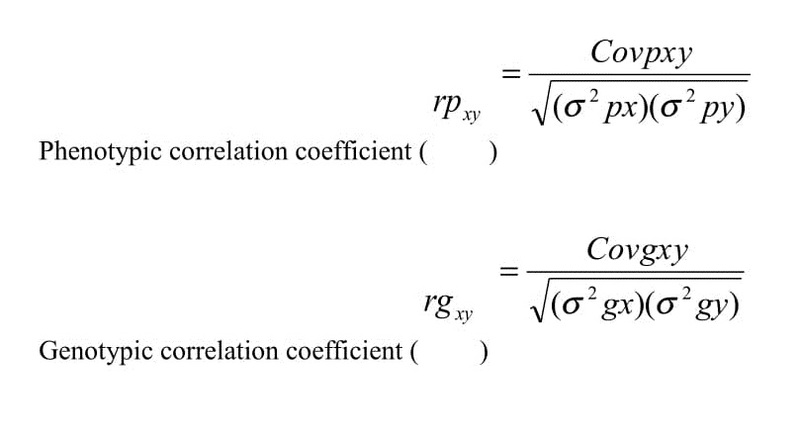 Where, rpxy is phenotypic correlation coefficient and genotypic correlation coefficient (rgxy) between character x and y; Covxy and Covxy are phenotypic covariance and genotypic covariance between character x and y; σ2gx and σ2gy are genotypic variances traits x and y; σ2px and σ2py are phenotypic variances of traits x and y, respectively. The correlation coefficient was analyzed based on the tabulated data, using META-R version-6.01 . The path coefficient analysis was computed for 12 yield related traits using the phenotypic and genotypic correlation results following the procedure suggested by Dewey and Lu . Seed yield per plant was used as dependent character in path coefficient analysis and the remaining traits were used as independent variables. Where, rij is mutual association between the independent character (i) and dependent traits (j) as measured by correlation coefficients, pij is components of direct effects of the independent traits (i) on the dependent traits (j), rikPkj = summation of components of indirect effect of a given independent character (i) on the dependent traits (j) via all other independent traits (k). The analysis of variance revealed significant difference among the genotypes for all traits, indicating the presence of sufficient variability among the tested accessions for the traits under consideration (Table 2). This result was in agreement with the previous results reported by [7,8]. Mean performance of 81 sesame genotypes for 13 traits (data not shown) showed that seed yield per plant was ranged from (2.6g) for Oromia-9 to (8.6g) for Oromia-22 with over all mean of 5.33g/plant. Generally, 44% of the genotypes had greater mean seed yield than the overall mean of genotypes. The highest mean seed yield/plant was recorded for Oromia-22 (8.66g) followed by Am-NW-13 (8.41g), Am-SW-5 (8.23), Oromia-25 (7.62g), Am-NW-14 (7.60g), Am-SW-10 (7.53) and Oromia-1 (7.51g). These genotypes were found to be superior even to the local checks. The highest and lowest mean oil content was recorded for Oromia-13 (52.15%) and Am-SW-7 (43.35%) genotypes, respectively, with overall genotypes mean of 47.1%. The genotype Oromia-13 (52.15%) and Am-NSh-2 (51.20%) had the highest mean oil content and was found to be superior as compared to the standard checks. A high variation in number of capsules/plant, primary branches/plant and plant height was found among the studied genotypes. Similarly, high variation in number of primary branches, plant height and 1000 seed weight was reported by Gidey et al. .
Phenotypic and genotypic correlation coefficients of the various traits are presented in table 3. The phenotypic and genotypic correlations in general were higher than the environmental correlation for the studied traits. Number of capsules/plant, biomass/plant, harvest index and 1000 seed weight exhibited highly significant (<0.001) and high positive association with seed yield/plant at both phenotypic and genotypic level, indicating that these traits are reliable yield components and seed yield can be improved through direct selection of these traits. Similar results were reported by Muhamman et al. , and Haruna et al. . Plant height and number of seeds/capsule showed highly significant and moderate positive correlation with seed yield/plant at both phenotypic and genotypic level. Number of primary branch/plant showed significant (<0.05) and low positive genotypic association with plant height, biomass/plant, harvest index and seed yield/plant. Hence, indirect selection in favor of these trait scan improve seed yield in sesame. Similar results were reported by Sumathi et al. and Sumathi and Muralidharan  for plant height, number of branches, number of capsules, days to 50% flowering, days to maturity and 1000 seed weight. However, oil content showed significant (<0.05) negative genotypic correlation with most of the yield traits (Table 3). This implies that indirect selection for high oil content would reduce seed yield/plant. Hence, simultaneous improvement for seed yield and oil content is difficult in the studied germplasm. Similar result was found by Daniya et al. . In the contrary,  found in significant positive correlation of oil content with seed yield and suggested that selection for oil content had no any effect on seed yield. Generally, correlation analysis revealed the presence of highly significant positive association between seed yield and the yield related traits such as number of capsules, biomass/plant, harvest index, 1000 seed weight and number of seeds/capsule. This finding is in line with [18,19,22,24] who reported significant positive correlations between yield traits and final seed yield in sesame. According to , correlation analysis may not be sufficient to explain the extent of associations in a manner that will enable one to decide on either a direct or an indirect selection strategy. Because of this, path coefficients analysis was carried out between the different traits at both phenotypic and genotypic levels to partition correlation coefficients into direct and indirect effects; permitting a critical examination of the specific forces acting to produce a given correlation and measuring the relative importance of the causal factors. The result of phenotypic path analysis (Table 4) revealed that biomass/plant (1.08) had maximum positive direct effect on seed yield/plant followed by harvest index (0.75) and capsules/plant (0.53). Similarly, at genotypic level (Table 5), biomass/plant (0.64), capsules/plant (0.60) and harvest index (0.34) imposed highest direct effect on seed yield/plant. These traits also had strong positive correlation with seed yield at both phenotypic and genotypic level. Therefore, these traits can be considered as the principal traits while selecting for seed yield. In other words, selection indices may be formed by considering all these traits for improvement of seed yield. This result was in agreement with previous studies on association of traits in sesame accessions of different countries [26-29]. The traits viz., 1000 seed weight (0.90), capsules/plant (0.85), harvest index (0.80) and number of seeds/capsule (0.73) showed maximum indirect effects on seed yield at phenol typiclevel. Thousand seed weight and seeds/capsule also showed high indirect effect at genotypic level (Table 5). Therefore, this finding strongly emphasized that these two traits (1000 seed weight and seeds/capsule) made the greatest indirect contribution to seed yield. However, both these traits had negative direct effect to seed yield/plant at phenotypic level, suggesting that direct selection in favor of these traits can affect seed yield. This result agreed with those of [29,30]. The result of this study indicated that there was sufficient variability among the tested genotypes. Mean performance of the different accessions suggested that 44% of the genotypes had greater mean seed yield than the overall mean. Genotypes Oromia-22, Am-NW-13, Am-SW-5, Oromia-25and Am-NW-14, exhibited the highest mean seed yield; while genotypes Oromia-13 and Am-NSh-2 found to have the highest mean oil content and were superior to the standard checks. Hence, these genotypes should be given emphasis to exploit their potential to increase sesame yield in mid-altitude areas of Ethiopia. The phenotypic and genotypic correlations in general were higher than the environmental correlation for the studied traits. Number of capsules/plant, biomass/plant, harvest index and 1000 seed weight showed highly significant positive association with seed yield, and hence, direct selection of these traits can improve sesame seed yield. Number of capsules/plant, biomass/plant, days to maturity and harvest index imposed maximum positive direct effect on seed yield. Thus, overall results suggested that these traits are the principal yield components while selecting for seed yield in sesame. In other words, selection indices may be formed by considering all these traits for improvement of sesame yield. The author gratefully acknowledges the financial support from Afar Pastoral and Agro-pastoral Research Institute (APARI) for this study. We are also obliged to the Ethiopian Biodiversity Institute of (EBI) for providing the seed materials of mid-altitude sesame germplasm collection. Sharma E, Islam TS, Khan F (2014) A review enlightening genetic divergence in Sesamum indicum based on morphological and molecular studies. Int J Agric Crop Sci 7: 1-9. Pham TD, Geleta M, Bui TM, Bui TC, Merker A, et al. (2011) Comparative analysis of genetic diversity of sesame (Sesamum indicum L.) from Vietnam and Cambodia using agro-morphological and molecular markers. Hereditas 148: 28-35. Bradley JM (2002) Food, industrial, nutraceutical, and pharmaceutical uses of sesame genetic resources. In: Trends in New Crops and New Uses. Janick J, Whipkey A. (eds.). ASHS Press, Alexandria, Virginia, USA. Abate M, Mekbib F, Ayana A, Negussie M (2015) Genetic variability and association of traits in mid-altitude sesame (Sesamum indicum L.) germplasm of Ethiopia. American J E A 9: 1-14. Tadele A (2005) Sesame (Sesamum indicum L.) Research in Ethiopia: A review of past work and potential and future prospects. Sesame and Safflower Newsletter 20. Kumaresan D, Nadrajan N (2002) Association of yield with some biometrical and physiology characters over different environments in sesame (Sesamum indicum L.). Sesame and Safflower Newsletter 17: 13-16. Salah B, Ahmed M, Abubakri FA (2013) Variability of yield and some morphological traits in some sesame (Sesamum indicum L.) genotypes under rain-fed conditions. Int J Agri Sci Res 2: 54-59. Parameshwarappa SG, Palakshappa MG, Salimath PM, Parameshwarappa KG (2009) Studies on genetic variability and character association in germplasm collection of sesame (Sesamum indicum L.). Karnataka J Agric Sci 22: 252-254. Jogdhande S, Vijay SK, Nagre K (2017) Correlation and Path Analysis Study in cowpea [Vigna unguiculata (L.) Walp.] genotypes. Int J Cur Micr Appl Sci 6: 3305-3313. Manisha RP, Vijay SK, Madhavi BB, Jadhav RD (2018) Correlation and path analysis study in F5 generation of cowpea. Int J Cur Micr Appl Sci 6: 1529-1537. Chaudhary RR, Joshi BK (2005) Correlation and path coefficient analyses in sugar cane. Nepal Agriculture Research Journal 6: 24-28. Bizeti HS, de Carvalho CGP, de Souza JRP, Destro D (2004) Path analysis under multicollinearity in soybean. Braz Arch Biol Technol 47. Gomez KA, Gomez AA (1984) Statistical procedure for agricultural research (2nd edn). John Wiley & Sons, New York, USA. Miller PA, Williams JC, Robinson HF, Comstock RF (1958) Estimates of genotypic and environmental variances and covariances in upland cotton and their implications in selection. Agronomy Journal 50: 126-131. Alvarado G, Lopez M, Vargas M, Pacheco A, Rodríguez F, et al. (2017) META-R (Multi Environment Trail Analysis with R for Windows) Version 6.01. CIMMYT, Mexico. Dewey DR, Lu KH (1959) A correlation and path-coefficient analysis of components of crested wheat grass seed production. Agronomy Journal 51: 515-518. Gidey YT, Kebede SA, Gashawbeza GT (2013) Assessment of genetic variability, genetic advance, correlation and path analysis for morphological traits in sesame genotypes. Int J Pl Breeding and Genetics 7: 21-34. Muhamman MA, Mohammed SG, Lado A, Belel MD (2010) Interrelationship and path coefficient analysis of some growth and yield characteristics in sesame (Sesamum indicum L.). J Agric Sci 2: 100-105. Haruna IM, Aliyu L, Olufajo OO, Odion EC (2012) Contributions of some growth characters to seed yield of sesame (Sesamum indicum L.). ISABB J Food and Agric Sci 2: 9-14. Sumathi P, Muralidharan V, Manivannan N (2007) Trait association and path coefficient analysis for yield and yield attributing traits in sesame (Sesamum indicum L). Madras Agric J 94: 174-178. Sumathi P, Murlidharan V (2010) Analysis of genetic variability, association and path analysis in the hybrids of sesame (Sesamum indicum L.). Tropical Agric Res Ext 13: 63-67. Daniya E, Dadari SA, Ndahi WB, Kuchinda NC, Babaji BA (2013) Correlation and path analysis between seed yield and some weed and quantitative components in two sesame (Sesamum indicum L.) varieties as influenced by seed rate and nitrogen fertilizer. Biology Agriculture and Healthcare 3. Onginjo EO, Ayiecho PO (2009) Genotypic variability in sesame mutant lines in Kenya. African Crop Science Journal 17: 101-107. Tamina B, Tapash D (2011) Effect of mutagenes on character association in sesame (Sesamum indicum L.). Pakistan J Bot 43: 243-251. Bhatt GM (1973) Significance of path coefficient analysis in determining the nature of character association. Euphytica 22: 383-393. Mothilal A (2005) Correlation and path analysis in sesame (Sesamum indicum L.). Environmental Eco. Ahadu M (2008) Genetic variability and association of characters in sesame (Sesamum indicum L.) Genotypes. Thesis Submitted to the Department of Plant Sciences, Haramaya University, Ethiopia. Pg no: 20-43. Goudappagoudra R, Lokesha R, Ranganatha ARG (2011) Trait association and path coefficient analysis for yield and yield attributing traits in sesame (Sesamum indicum L.). Elect J Plant Breeding, 2: 448-452. Ibrahim SE, Khidir MO (2012) Genotypic correlation and path coefficient analysis of yield and some yield components in sesame (Sesamum indicum L.). Int J Agric Sci 2: 664-670. Azeez MA, Morakinyo J A (2011) Path analysis of the relationships between single plant seed yield and some morphological traits in sesame. Int J Pl Breeding and Genetics 5: 358-368. Table 1: List of sesame accessions collected from mid-altitude areas of Ethiopia used in the experiment. Table 2: Mean squares from analysis of variance for 13 agro-morphological traits in 81 sesame genotypes. Note: **,* = Significance at P<0.01 and P<0.05 level, respectively; figures in parenthesis refer to degrees of freedom; CV = Coefficient of Variation, Gen = Genotypes, SE = Standard Error. Table 3: Genotypic correlation above diagonal and phenotypic correlation below diagonal among 13 traits in 81 sesame genotypes. Note: ***, **,* = Significant at P<0.001, <0.01 and <0.05 respectively. DF = Days to flowering, DM = Days to maturity, PBPL = Number of Primary Branches Per Plant, CPPL = Number of Capsules Per Plant, SDPC = Number of Seeds Per Capsule, CL = Capsules Length, PH = Plant Height, BMP = Biomass Per Plant, HIPL = Harvest Index Per Plant, TSW = 1000 Seed Weight, SYPL = Seed Yield Per Plant, SYH = Seed Yield Per Hectare, and OC = Oil Content. Table 4: Direct (diagonal) and indirect effect (off diagonal) of quantitative traits on seed yield/plant at phenoltypic level in 81 sesame genotypes. Table 5:Direct (diagonal) and indirect effect (off diagonal) of quantitative traits on seed yield/plant at genotypic level in 81 sesame genotypes. DF = Days to Flowering, DM = Days to Maturity, PBPL = Number of Primary Branches/ Plant, CPPL = Number of Capsules/Plant, SDPC = Number of Seeds/Capsule, CL = Capsules Length, PH = Plant Height, BMPL = Biomass/Plant, HIPL = Harvest Index/Plant, TSW = 1000 Seed Weight, SYPL = Seed Yield/Plant and OC = Oil Content. Citation: Abate M (2018) Correlation and Path Coefficient Analysis in Mid-Altitude Sesame (Sesamum indicum L.) Germplasm Collection of Ethiopia. J Plant Sci Curr Res 2: 006. Copyright: © 2018 Abate M, This is an open-access article distributed under the terms of the Creative Commons Attribution License, which permits un­restricted use, distribution, and reproduction in any medium, provided the original author and source are credited.